OK, it’s quiz time. Name four players to have left Spurs since the end of last season. Well, you got Gazza and Lineker straight away, and remembered Paul Stewart without too much trouble – but you’re stuck now aren’t you? But come on… what about Matthew Edwards? Just to jog your memory, he’s the 21-year-old striker who joined Brighton on a free from Tottenham in the summer – and hasn’t looked back since. Legend has it that he decided to leave White Hart Lane the day his then-boss, Peter Shreeves, couldn’t remember who he was. Now his pace and skill have got the Goldstone fans singing his name, with the Seagulls making an encouraging, if unspectacular, start to their Second Division season. “It’s been a great move for me,” he says. “It’s just fantastic to be a regular part of a first team squad. “At Spurs I didn’t get a look in. The nearest I got was when I went to Everton last year as a member of the squad. It seemed that no matter how hard you tried, no matter what you did, it wouldn’t get you anywhere. And that’s not a nice feeling. “Also, Spurs had so many players that we were divided up at training, but at Albion there’s a smaller squad and we all train together. There’s a great team spirit. “And it’s helped me come out of my shell. At Spurs I was a bit in awe of the stars and really you had to be full of yourself to make your face fit. “It’s hard to motivate yourself in front of an empty stadium with the reserves. But at Brighton it’s totally different. The utility forward was in the limelight again when he scored the only goal in a south coast derby in the Third Round of the FA Cup against Portsmouth. 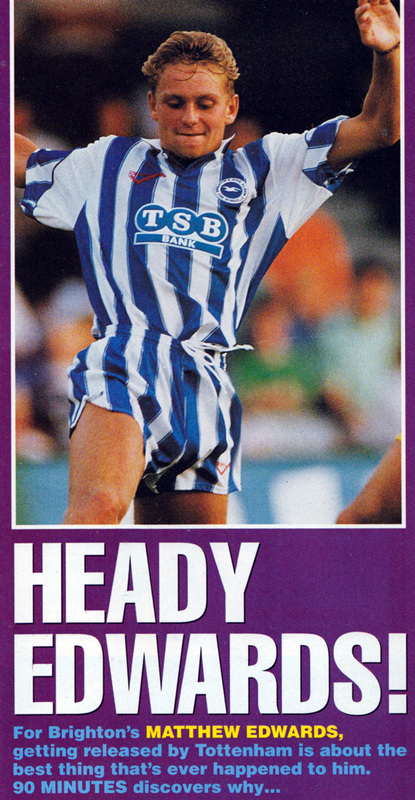 However, he was released at the end of the 1993/94 campaign. Edwards later had spells with Kettering Town, Walton & Hersham and Enfield. He is currently Business Development Manager at Advanced Ticketing, a position he has held since November 2010.